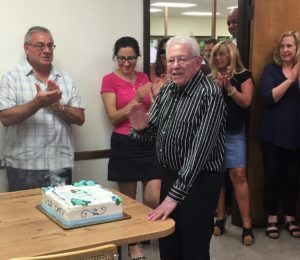 Norm Mason, The President, and Founder of Mason Industries, celebrated his 93rd birthday in August. 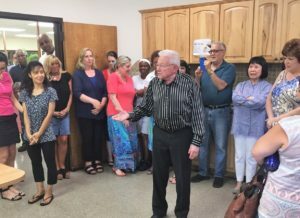 As has been our tradition for many years, we all got together in the kitchen to wish Norm a very happy birthday. We thought you might enjoy a few photos from our get together. 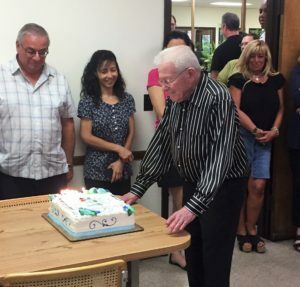 A few folks from the Mason Industries Family join Norm on his 93rd birthday! Norm enjoys the New Yorker cartoons as you know from his circular letters. This one on the cake was just right. Norm about to blow out the candles. (No, we did not put 93 candles on the cake). Norm has led Mason Industries for the past 59 years and looks forward to a better 50 now that he has the experience. 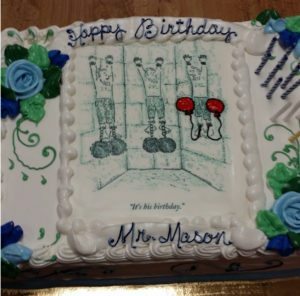 Congratulations for 25 years of service at Mason Industries.